BU assistant captain Matt Lane has signed an AHL contract with the Rochester Americans for the 2016-17 season, the team announced Wednesday morning. Lane, an undrafted free agent, becomes the third Terrier since the end of the season to sign a professional contract. During his senior campaign at BU, Lane finished fourth on the team in points (28), recording 14 goals and 14 assists, both career highs. Lane finished his BU career with 69 points and 33 goals. A native of Rochester, New York, Lane is now the third BU player to join the Americans within the last year, as former forwards Evan Rodrigues and Cason Hohmann have both spent time with the Buffalo Sabres’ affiliate this season. There were more than 40 minutes of sloppy play for the No. 10 Boston University men’s hockey team on Saturday. Unlike Friday’s comeback win that saw the Terriers (6-4-2, 3-2-2 Hockey East) struggle for two periods before breaking out in the third and defeating the No. 12 University of Michigan, BU couldn’t put together a comparable final frame effort in game two. Instead, the Terriers labored through almost all 60 minutes and fell by a score of 4-2 to the Wolverines (6-2-1), earning a split on the weekend. “The good news is we did get a win this weekend, so it’s not like we got swept, but the game doesn’t lie to you, and it just didn’t feel great this weekend, even though we did win a game,” said head coach David Quinn. There wasn’t a ton to like about this one, but here’s a look at BU’s pluses and minuses from the loss. Since a lot of the things that went wrong for BU are hard to really talk about completely separate from one another, I’m just going to give this a go in one big chunk. Quinn stressed on Friday that he was happy with the progress his team has made in the past three weeks and how it’s performed, staying out of the loss column for six straight games. And while the Terriers were able to put their all into the third period during the first game of the weekend and pull out a win, they still looked unlike themselves in five of six total periods. BU was slow, sluggish and playing without energy in two straight games, and Quinn said he takes a lot of responsibility for that. Good players didn’t play well, and when that happens, he said, as a coach you ask yourself what happened. Michigan was quicker, more physical, playing at a higher pace and winning most one-on-one battles throughout the game, Quinn said. He also noted that the team wasn’t as physical in open ice as it might have needed to be in order to succeed. Hockey, as a game, gets more physical along the boards and then less so as the puck travels through open ice. When the Terriers are physical, Quinn said, and challenge opponents everywhere on the ice, they’re a lot more effective. Senior forward Matt Lane, in line with Quinn’s assessment of the team, said BU could have been sharper in certain facets of the game, like passing. While Michigan is strong and gave the Terriers trouble, it’s still on them to take responsibility for failing to generate offense, Lane said. BU was out-attempted 63-55, a margin of eight shot attempts, but only got 21 of those on goal compared to the Wolverines’ 38. “We missed too many nets, we didn’t get enough traffic in front, and that leads to less zone time,” Lane said. “Just a combination of those things leads to a lack of shots, a lack of scoring chances, things that we’ve done so well over the last few weeks just seemed to disappear tonight. That’s on us. Still, Quinn is confident the team will be able to get back to doing what it had been until this weekend. 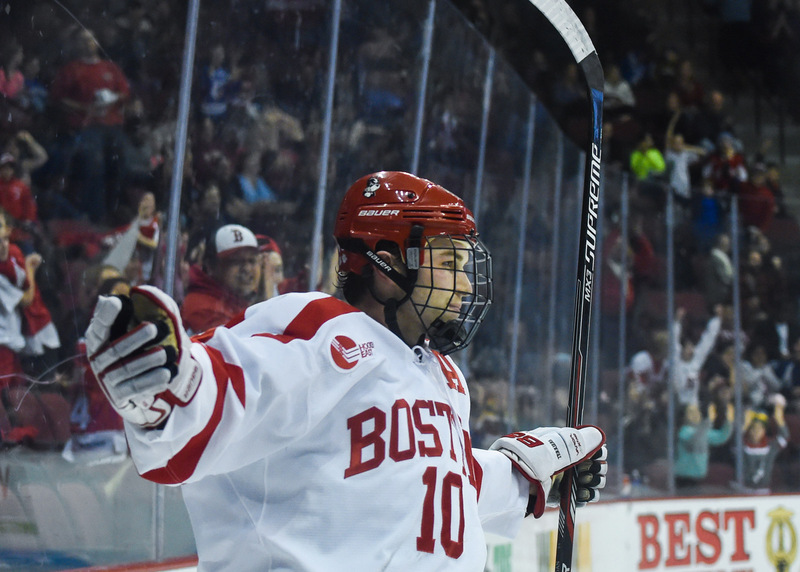 For a more detailed look at the specifics of BU’s offensive struggles, check out Sarah’s sider. Toward the end of the third period, BU had a scare when senior captain Matt Grzelcyk tried to check a Wolverine into the endboards and fell to his knees. He couldn’t get up without assistance and was helped off the ice and down the tunnel. 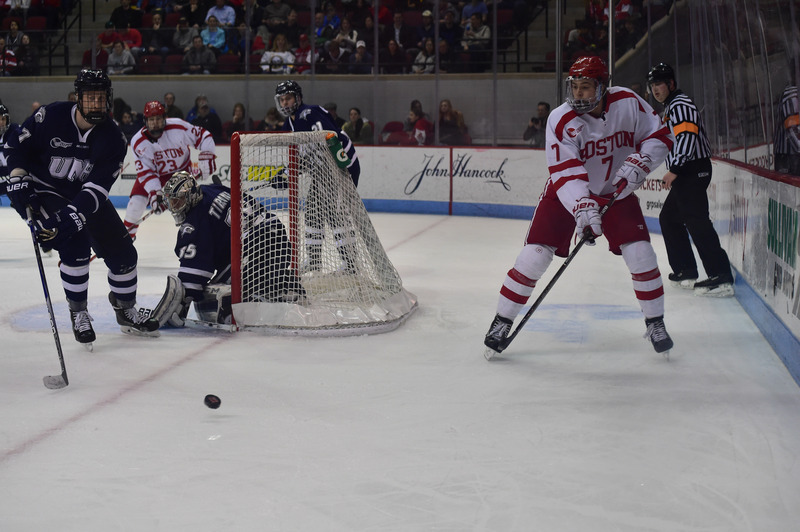 The blue liner returned from his offseason knee surgery recovery just two weeks ago on Nov. 6 when the Terriers hosted Northeastern University. It looked like the team might have lost its captain again, but following the game, Quinn said the knee Grzelcyk injured on Saturday, his left, was not the same one that he had the surgery on over the summer and that it wasn’t an ACL injury. In fact, the medical staff told him they thought he might be able to play Tuesday when Bentley University comes to Agganis Arena. “We’re very optimistic that he actually might be able to play Tuesday,” Quinn said. The offense as a whole did not have a particularly memorable game, but Lane was able to net one of BU’s two goals on the night. He drove to the cage with the puck with 2:23 to play in the second period and slipped it between netminder Steve Racine’s legs, putting the Terriers on the board.